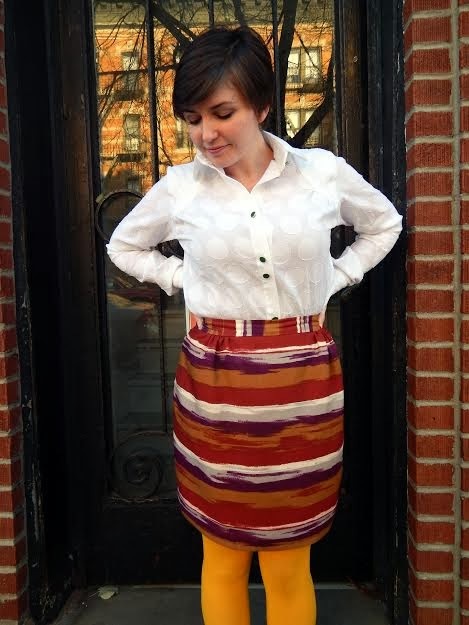 Today, I want to show y'all this gorgeous Meissa Blouse, sewn up by Ashley! When Katie showed me the designs for the new collection, my first thought was: Sigma Skirt, Meissa Blouse, and Bellatrix Blazer. How cute would that be for work? But, there was just no way that I was going to be able to finish all of those garments as a pattern tester! So, I started with Meissa, mostly because I really needed a basic white shirt to go with all of my crazy prints! The fabric I chose here really was absolutely perfect for the pattern. It's a cotton gauze with polka dots woven in. As a single layer, it's lightweight enough that the yoke gathers were easy to do. When interfaced and lined, it's sturdy enough that the collar, cuffs, and band all retained their shape perfectly. There are really so many possibilities with fabric choice here, but if you happen to be sitting on a pile of cotton gauze, I think it's a winning combo! Because I just couldn't stomach the thought of a plain white blouse, I chose some bright green and gold buttons. I had them in two different sizes, so I chose to use two small buttons on the cuffs, and larger buttons up the front. I love the little pop of color they give to the front. A couple of days ago, I put this on to photograph it, and inspiration struck. I was going to make my Sigma-Meissa dreams come true! 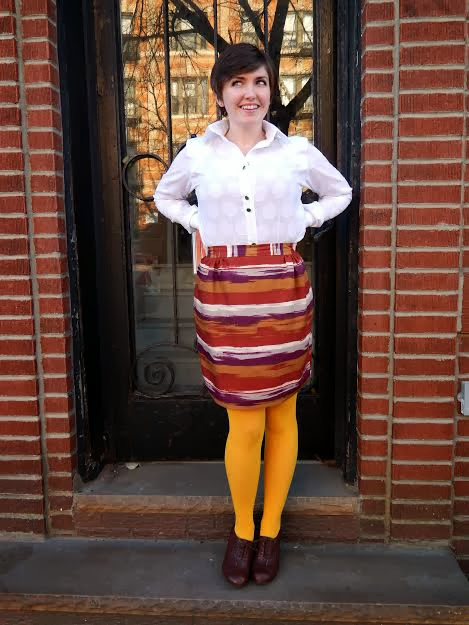 I cut out the skirt from some striped rayon (but left out the pockets) and 3 hours later, I had an awesome fall skirt. The Sigma skirt is a seriously fast, easy make! I chose to line mine (the lining mustard and matches my tights, in case you were wondering) and finished the hem with some green bias tape to match my buttons. I really love this! A white blouse is such a good basic to have in your wardrobe, but talk about a boring thing to sew! Even just the pretty detailing of this pattern would be a good way to jazz up at white shirt (oh lord, did I really just use "jazz up" to describe something? I'm becoming an old woman...), but Ashley really went the extra mile by using such a cool fabric! I have GOT to get my hands on some of that! Thanks so much for sharing your pieces with us, Ashley! 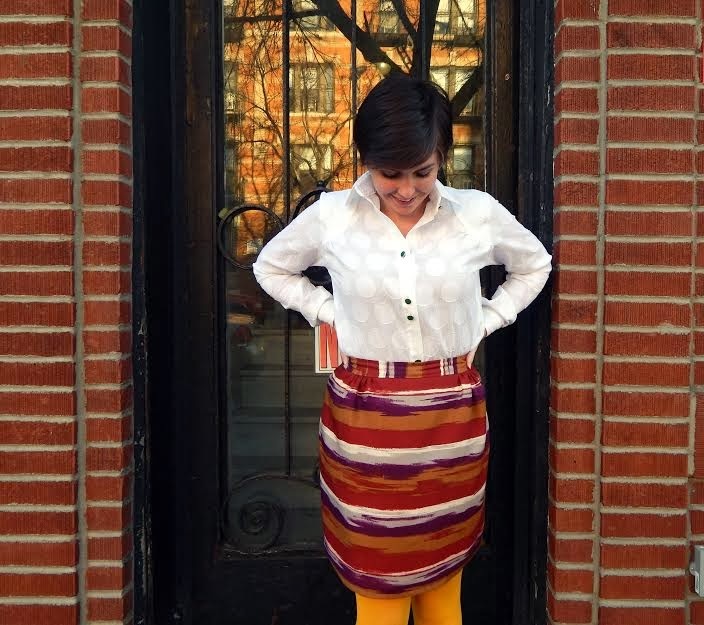 As always, if you'd like to read more about the blouse, head over to Ashley's blog!